We've spent the past three months mostly working on redesigning some of the core implementation of our SyntaxEditor control and wanted to give an update today on where things stand. From this point forward, we'll call this development effort "SyntaxEditor vNext". The first phase of this was described in our previous Building a Better SyntaxEditor Text Rendering Engine post. What we've done is come up with a common API that can be used for text rendering and is the same across WPF, UWP, and WinForms. It allows consumers of this text rendering API (namely SyntaxEditor) to have a single way to perform all its core text formatting/rendering, etc. This is important because when we have a common API wrapper for performing those difficult and very platform-specific tasks, we are able to consolidate all the code that calls into that API to be more or less platform agnostic. And that means the WinForms SyntaxEditor will see some huge benefits. More on that below. The new UWP text rendering engine implementation is much, much faster than the current way we render text in the UWP SyntaxEditor. 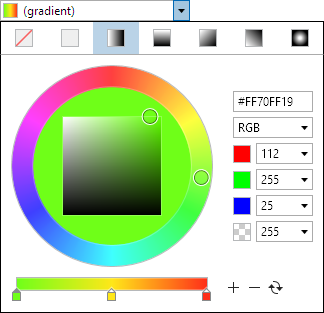 In fact it might even be rendering faster than the WPF version now! The new UWP text rendering engine also allows for more culture-sensitive logic involving caret movement, right-to-left text, etc. The new WinForms text rendering engine implementation is also faster than before and now supports culture-sensitive logic involving caret movement, right-to-left text, etc. 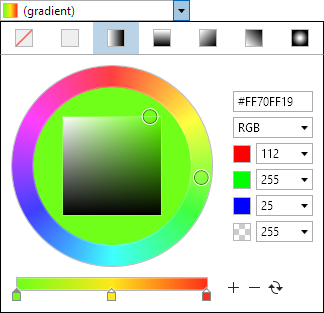 The WPF text rendering engine implementation has always been the most advanced one, and it's getting even better. It features improved efficiency and handles extremely long lines better. Per above, a key benefit of having a common API for text formatting/rendering is to finally make progress on migrating the WinForms SyntaxEditor to share code with the other newer platforms that already share a majority of code. This would mean that the WinForms version would get all the benefits of the more advanced add-ons found in the WPF version, etc. This is huge for WinForms SyntaxEditor customers, and parity with the WPF version is something many customers have asked for. In more recent weeks, we've been refactoring a lot of SyntaxEditor's internals that are related to views, including view management, splitting, scrolling, etc. We're building a new internal codebase for those features that works the same across WPF, UWP, and WinForms. And best of all, we're doing our best to keep the same public API as the current WPF version so that there will be minimal breaking changes. Scrolling has been improved so that you can easily scroll an editor view to any line and even designate if that line should appear near the top/center/bottom of the view, and how far to pixel offset from that location. This will be wonderful for features like go to line. When resizing an editor view that is scrolled to the right, if you now resize it even wider, the view lines will anchor to the right when appropriate to make sure not too much whitespace appears at the right side of the view. In the current SyntaxEditor implementations, the horizontal scrollbar wouldn't scroll at all in that scenario, leading to a lot of extra blank space on the right side of the view. When vertically scrolling through documents with various view line widths, the current SyntaxEditor implementations will adjust the horizontal scrollbar maximum mostly based on the visible view lines' maximum width. The newer implementation tries to remember longer line max widths it's seen in the past and prevents a lot of the horizontal scrollbar maximum jumpiness that can happen when scrolling vertically. We're really excited about where things are heading. Not only are we getting a better internal codebase for managing a lot of view-related features, we're adding features as we go, and are consolidating the WPF, UWP, and WinForms codebases such that they will share 95%+ of the code. This will allow for language add-on codebases to be shared across all platforms. And the public SyntaxEditor API changes for the WPF/UWP platforms will be kept to a minimum. If you have any specific view-oriented features that you'd like to see in SyntaxEditor, now is the time to get your suggestions in. We're chatting daily about progress in our Slack workspace and would love for you to discuss SyntaxEditor with us there. Our v2017.2 WPF, Universal Windows, and Silverlight controls have all been updated with new maintenance releases that are now ready for download. It is highly recommended that you get these new builds since many products received numerous minor enhancements and bug fixes. Let's take a quick look at some of the more notable features that were added. The mouse wheel can now scroll document tabs when in an overflow situation and using certain tab overflow behaviors. 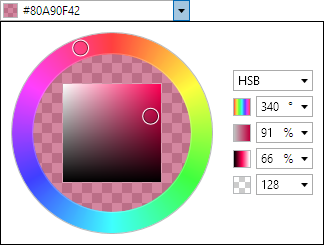 Updated the color pickers such that the end user can tap and drag anywhere in a hue ring or saturation/brightness square to change color attributes, and not just on the thumb. 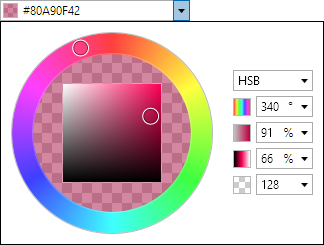 Added a new drop-down to ColorPicker that allows switching between RGB and HSB text input modes. Added new features for adding custom inline UI elements within edit boxes, like the "Now" button in the TimeEditBox below. 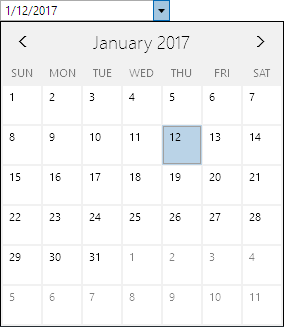 Improved the DateEditBox and TimeEditBox default formats to better support parsing of entered text values that lack part delimiters. Added the TreeListViewColumn.SortDirection property and related ColumnSortDirection enumeration that can be used to indicate that a sort glyph should appear in the column header when paired with a custom sorting mechanism. Improved TreeListBox to better handle property updates from view-models on other threads. Improved TreeListBox selection tracking performance. Improved numerous edit actions to retain their final selection after the action goes through an undo/redo process. Improved how Tab indenting is handled when there is a block selection. Improved the Cut Line to Clipboard edit action to support multiple lines. Improved the .NET Languages Add-on's logic for selecting the best IntelliPrompt parameter info member overload when typing a comma at the end of an argument list. Improved the XML line commenter in the Web Languages Add-on to comment the entire line text when there is no selection. The past several weeks, we've been prototyping a new core text rendering engine for future use with SyntaxEditor (and possibly other products) that can be used across multiple platforms. This text rendering API is the same across all supported platforms, which currently are WPF, UWP, and WinForms. The implementation of that common API is platform-specific behind the scenes since each UI platform supports rendering text in very different ways. SyntaxEditor would be a consumer of that text rendering API. By using that text rendering API that is common across platforms, we could consolidate all the SyntaxEditor logic related to text formatting, rendering, and hit testing to be the same. First the UWP version's text rendering implementation in this new engine is lightning fast, and would yield a massive rendering speed increase when merged into the UWP SyntaxEditor, compared to our current way of rendering text in the UWP SyntaxEditor. It also would be more culture-sensitive with better logic on caret movement, right-to-left text, etc. The WinForms version's implementation is also fast and compared to the current WinForms SyntaxEditor's way of rendering text, would gain culture sensitivity for caret movement, right-to-left text, etc. Having a common text rendering API with other platforms would also be a big step in moving the WinForms SyntaxEditor down a path towards using the same general SyntaxEditor API as the other newer UI platforms use. A future goal is to make this happen so that changes we make to features, add-ons, etc. can flow freely between all the SyntaxEditor platforms. Finally the WPF version's text rendering is already very fast and culture-sensitive, but there are several logic enhancements we're making to improve speed when rendering long lines. We're still working on everything, but so far, tests in separate projects are very promising for the future of this text rendering API experiment. Once things are finalized a bit more, we may plug it into one of the platforms like UWP to begin actual usage testing with SyntaxEditor. This process will take some time since we will have to pull out all the plumbing for the current SyntaxEditor text rendering implementation, and adjust things to work with this new API. We will give some updates once we make progress on that end. We're happy to announce that the 2017.2 versions of our WPF, Universal Windows, and Silverlight controls have been released. These versions include some new controls, new features, and a lot of minor updates and bug fixes. Full support for intra-line adornments is now included. These allow whitespace to be reserved above and/or below view lines, and adornments rendered in that space. 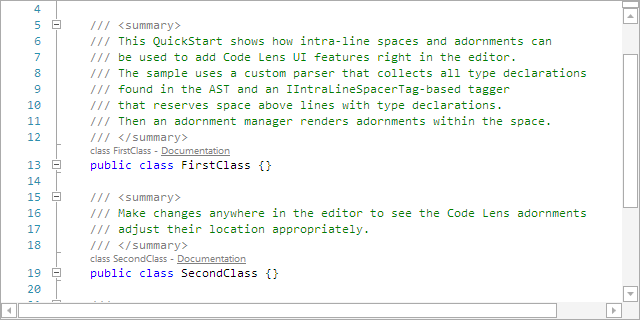 A first new sample shows implementation of a Visual Studio-like Code Lens adornment with info display and hyperlink. 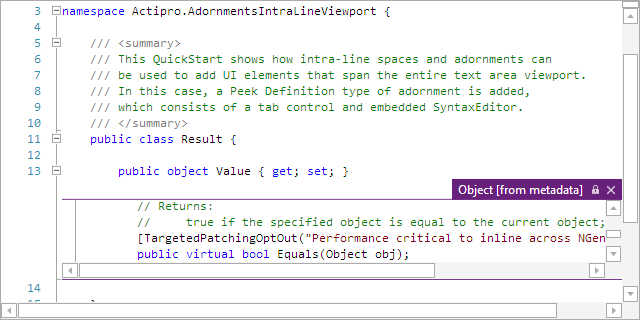 A second sample shows a Visual Studio-like Peek Definition (embedded editor) display. This is accomplished using a second SyntaxEditor within an adornment of the outer SyntaxEditor. Vertical scrolling logic has been refactored to better handle view lines of various sizes. A couple new code outlining commands have been added: apply default outlining expansion and expand all outlining. A new optional assembly is available that has Roslyn extensions for loading IBinaryAssembly instances that can be referenced by a project assembly, instead of using normal .NET reflection. IntelliPrompt completion is now available for object creation expression initializer member names. A new property can be data-bound to your VM to float or restore a docking window. The default location request event allows for specifying that a docking window should open in a floating dock host. Docking windows that were closed while floating now support more precise restoration later. Dragging standalone floating docking windows by their tabs now has a better experience. The read-only contextual indicator for documents now uses a separate display mechanism from the custom contextual indicators, allowing both to show at the same time. 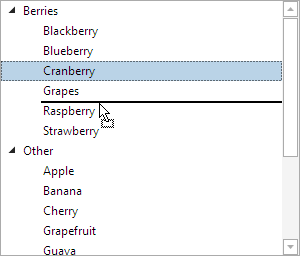 A new AutoCompleteBox control has been added that allows text entry and provides suggestions for auto-completion. This kind of control is ideal for use in search query and quick launch kinds of scenarios. 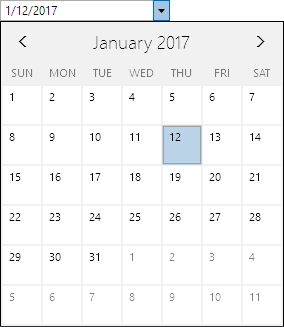 Clicking a date on the popup calendar now closes the popup. The TreeListBox item adapter has been updated with a method that fires when hovering over an item during a drag, allowing you to determine whether it should be expanded. New adapter methods have also been added that are called immediately before and after a drag, allowing for custom adornments to be displayed while dragging. A new AdvancedTextBlock control has been added that can show a tooltip when overflowed and can highlight spans of text based on captured text ranges (i.e. filter match results). In this quarter, we continued enhancing the 2017.1 versions of our WPF Controls, Universal Windows Controls, and Silverlight Controls. Docking/MDI gained many minor feature improvements. Editors added better support for custom formats in numeric edit boxes, default values, and had other tweaks. Grids improved tree filtering, empty content display, column header taps, focus tracking, and added/updated several samples. SyntaxEditor's .NET Languages Add-on added C# 6 and VB 14 syntax support, improved resolver logic for partial classes and base types, and more. Numerous other updates were made across these and other products. We currently are working on finishing up the feature set for the 2017.2 versions. Docking/MDI has a lot of updates related to floating windows, Editors adds a new AutoCompleteBox control, SyntaxEditor adds intra-line adornments (like the VS editor's Code Lens or Peek Definition features) and scrolling logic is refined, and the .NET Languages Add-on is getting an option to use Roslyn to load reflection information for referenced assemblies. Most information on these new controls and features will be published soon. We hope to roll v2017.2 out in the next several weeks.